Many users are complaining that Windows 8 lacks a basic feature, the Start Menu. I am not sure if I really miss it, I think the metro screen is good enough but I do miss few features like the “Send to” menu, especially for creating shortcuts on the desktop. There are a few softwares which enable you to get the Start Menu back to Windows 8 but my favorite one is Iobit’s StartMenu8, not just because it is free. Read on to find out more about it. Iobit’s StartMenu8 adds the Start Menu and all the options we had in the Windows 7 Start menu. Now we can have the good old search bar too. Additionally with this tool, you can login directly to your Classic Desktop without going to the Metro screen. And you can even disable the software from starting up and still skip the Metro screen. Think this is not enough for a free tool? Here’s more, it also allows you to disable the Hot Corners in Windows 8. You can even select different Start Buttons. You can also customize it further with different skins. Here is a tutorial for that at Iobit’s forums . Of course, you can always disable/enable any option that you want in StartMenu8. Even though they say it is a beta version, it is working perfectly fine for me except for one bug which I’ve listed below. 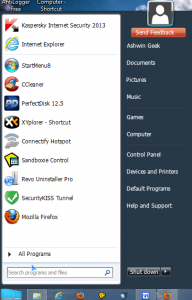 Adds the Start menu back to Windows 8 with the usual Search Bar, and other useful shortcuts. 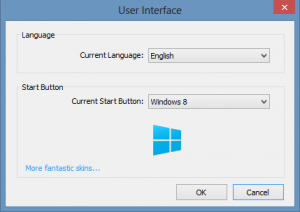 Note: Iobit StartMenu8 only supports English Language for now.